No one will argue that teamwork is what makes a team great. Spend some time hanging around successful teams and I’m pretty sure you will sense true camaraderie between players. Conversely, when teammates are at odds with each other and don’t respect one another, it usually shows up negatively in their performance. It is no different with all the adults involved in youth sports, from volunteers to coaches to parents to officials to league administrators. When they work together as a team, it shows. The kids are happier, the spectators are positive, and the coaches can focus on helping kids develop and grow. When they are at odds with each other and don’t respect one another, it shows up negatively in their kids’ game and in the whole atmosphere of the season. Teamwork between every adult involved in youth sports is just as important as teamwork between players. Here’s a simple blueprint that, if followed consistently, will help build the adult team. 1. Keep communication clear and consistent. I’ve known many adults who struggled with this. But the best adults in youth sports that I’ve worked with over the years have been ones who went above and beyond in communicating. It’s always better to over-communicate than to assume. Coaches, administrators & officials—take the time to let parents know everything they need to know, from scheduling to playing and coaching philosophies. Say it often, say it clearly. 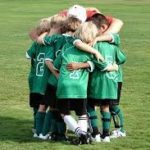 Parents should be intentional about communicating too, especially to the coach. When your child is going to miss a practice or a game, let the coach know. If you have safety concerns, let the league know. Communicate your support first and foremost to everyone who is volunteering their time, and then if a real concern arises, they will be more likely to listen. 2. Respect each other’s jobs. The coach’s role is to develop players, encourage character development, manage the team and the game, and keep players safe. The parent’s job is to support and encourage their child, and protect when totally necessary. The official’s job is to keep players safe and orderly. The league’s job is to maintain a safe and healthy league culture. If parents don’t like the way any of the coaches, officials, and league administrators are doing their job, it might be time for them to officially join the team. Help coach, get your official’s license, help out with the league. Trying to do another person’s job when it’s not yours can cause confusion and conflict. The directive Seek to Understand from Stephen Covey’s book The 7 Habits of Highly Effective People has been a mantra in our home. There is always a reason that someone acts the way they do. But often, adults in youth sports are so focused on their own understanding of a situation that they cannot see anything else. Seeking to understand doesn’t mean that you have to know everything that is going on in another person’s head, it simply means that you recognize that there is an explanation for their behavior. It doesn’t even mean that you agree or like the explanation, it only means that you can sympathize that they have a reason for why they are doing what they do. That perspective alone will help you extend some grace and may even open up opportunities for conversations that really will help you to understand. That’s it. Following those three directives will help adults in youth sports work together as a team. It’s not rocket science. But it does take commitment on both sides. Are you willing to follow the blueprint to work together?